Latin was originally spoken in the area around Rome, known as Latium. Through the power of the Roman Republic, it became the dominant language, initially in Italy and subsequently throughout the western Roman Empire. Vulgar Latin developed into the Romance languages, such as Italian,French,Portuguese, Romanian and Spanish. Latin, Greek and French have contributed many words to the English language. In particular, Latin (and Ancient Greek) roots are used in English descriptions of theology, biology, science, medicine and law. During the late republic and into the first years of the empire, a new Classical Latin arose, a conscious creation of the orators, poets, historians and other literate men, who wrote the great works of classical literature, which were taught in grammar and rhetoric schools. Today’s instructional grammars trace their roots to such schools, which served as a sort of informal language academy dedicated to maintaining and perpetuating educated speech. Philological analysis of Archaic Latin works, such as those of Plautus, which contain snippets of everyday speech, indicates that a spoken language, Vulgar Latin (termed sermo vulgi, “the speech of the masses”, by Cicero), existed concurrently with literate Classical Latin. The informal language was rarely written, so philologists have been left with only individual words and phrases cited by classical authors and those found as graffiti. One key marker of whether a given Romance feature was found in Vulgar Latin is to compare it with its parallel in Classical Latin. If it was not preferred in Classical Latin, then it most likely came from the undocumented contemporaneous Vulgar Latin. For example, the Romance for “horse” (Italian cavallo, French cheval, Spanish caballo, Portuguese cavalo and Romanian cal) came from Latin caballus. However, Classical Latin used equus. Therefore, caballus was most likely the spoken form. 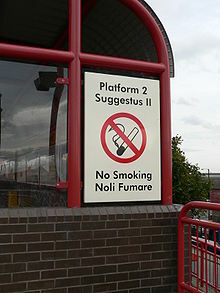 The signs at Wallsend Metro station are in English and Latin as a tribute to Wallsend’s role as one of the outposts of the Roman Empire. The largest organisation that retains Latin in official and quasi-official contexts is the Catholic Church. Latin remains the language of the Roman Rite; the Tridentine Mass is celebrated in Latin. Although the Mass of Paul VI is usually celebrated in the local vernacular language, it can be and often is said in Latin, in part or in whole, especially at multilingual gatherings. It is the official language of the Holy See, the primary language of its public journal, the Acta Apostolicae Sedis, and the working language of the Roman Rota. Vatican City is also home to the world’s only automatic teller machine that gives instructions in Latin. In the pontifical universities postgraduate courses of Canon law are taught in Latin, and papers are written in the same language. In the Anglican Church, after the publication of the Book of Common Prayer of 1559, a Latin edition was published in 1560 for use in universities such as Oxford and the leading “public schools” (English private academies), where the liturgy was still permitted to be conducted in Latin. There have been several Latin translations since, including a Latin edition of the 1979 USA Anglican Book of Common Prayer. Switzerland has adopted the country’s Latin short name Helvetia on coins and stamps, since there is no room to use all of the nation’s four official languages. For a similar reason, it adopted the international vehicle and internet code CH, which stands for Confœderatio Helvetica, the country’s full Latin name. Canada‘s motto A mari usque ad mare (“from sea to sea”) and most provincial mottos are also in Latin. The Canadian Victoria Cross is modelled after the British Victoria Cross which has the inscription “For Valour”. Because Canada is officially bilingual, the Canadian medal has replaced the English inscription with the Latin Pro Valore. Several states of the United States have Latin mottos: such as Connecticut‘s motto Qui transtulit sustinet (“He who transplanted sustains”); Kansas‘s Ad astra per aspera (“To the stars through hardships”); Michigan‘s Si quaeris peninsulam amoenam, circumspice (“If you seek a pleasant peninsula, look about you”); Missouri‘s Salus populi suprema lex esto (“The health of the people should be the highest law”); North Carolina‘s Esse quam videri (“To be rather than to seem”); Virginia‘s Sic semper tyrannis (“Thus always to tyrants”); and West Virginia‘s Montani semper liberi (“Mountaineers are always free”). Many military organizations today have Latin mottos, such as Semper paratus (“always ready”), the motto of the United States Coast Guard; Semper fidelis (“always faithful”), the motto of the United States Marine Corps; and Per ardua ad astra (“Through adversity/struggle to the stars”), the motto of the Royal Air Force (RAF). Some colleges and universities have adopted Latin mottos, for example Harvard University‘s motto is Veritas (“truth”). Veritas was the goddess of truth, a daughter of Saturn, and the mother of Virtue. Hampden-Sydney College has Huc venite iuvenes ut exeatis viri (“Come here as boys so you may leave as men”) as its motto, as the continued instruction of Latin is seen as a highly valuable component of a liberal arts education. Latin is taught at many high schools, especially in Europe and the Americas. It is most common in British public schools and grammar schools, the Italian liceo classico and liceo scientifico, the German Humanistisches Gymnasium and the Dutch gymnasium. In the United States, it is taught at Baltimore City College, Boston Latin Academy, Boston Latin School, Brooklyn Latin School, Pope John Paul II High School, Central High School of Philadelphia, English High School of Boston, Norwell High School (Massachusetts), Oak Hall School, and many other public and private schools. Some films of ancient settings, such as Sebastiane and The Passion of the Christ, have been made with dialogue in Latin for the sake of realism. Occasionally, Latin dialogue is used because of its association with religion or philosophy, in such film/television series as The Exorcist and Lost (“Jughead“). Subtitles are usually shown for the benefit of those who do not understand Latin. There are also songs written with Latin lyrics. The libretto for the opera-oratorio Oedipus rex by Igor Stravinsky is in Latin. 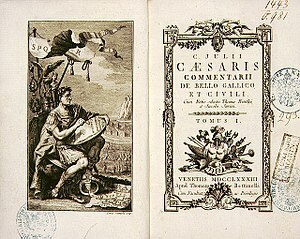 Julius Caesar‘s Commentarii de Bello Gallico is one of the most famous classical Latin texts of the Golden Age of Latin. The unvarnished, journalistic style of this patrician general has long been taught as a model of the urbane Latin officially spoken and written in the floruit of the Roman Republic. Latin translations of modern literature such as The Hobbit, Treasure Island, Robinson Crusoe, Paddington Bear, Winnie the Pooh, The Adventures of Tintin, Asterix, Harry Potter, Walter the Farting Dog, Le Petit Prince, Max and Moritz, How the Grinch Stole Christmas!, The Cat in the Hat, and a book of fairy tales, “fabulae mirabiles“, are intended to garner popular interest in the language. Additional resources include phrasebooks and resources for rendering everyday phrases and concepts into Latin, such as Meissner’s Latin Phrasebook. The Latin influence in English has been significant at all stages of its insular development. In the Middle Ages, borrowing from Latin occurred from ecclesiastical usage established by Saint Augustine of Canterbury in the 6th century or indirectly after the Norman Conquest, through the Anglo-Norman language. From the 16th to the 18th centuries, English writers cobbled together huge numbers of new words from Latin and Greek words, dubbed “inkhorn terms“, as if they had spilled from a pot of ink. Many of these words were used once by the author and then forgotten, but some useful ones survived, such as ‘imbibe’ and ‘extrapolate’. Many of the most common polysyllabic English words are of Latin origin through the medium of Old French. 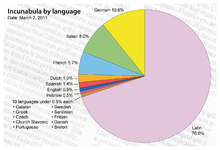 Romance words make respectively 59%, 20% and 14% of English, German and Dutch vocabularies. Those figures can rise dramatically when only non-compound and non-derived words are included. The influence of Roman governance and Roman technology on the less-developed nations under Roman dominion led to the adoption of Latin phraseology in some specialized areas, such as science, technology, medicine, and law. For example, the Linnaean system of plant and animal classification was heavily influenced by Historia Naturalis, an encyclopedia of people, places, plants, animals, and things published by Pliny the Elder. Roman medicine, recorded in the works of such physicians as Galen, established that today’s medical terminology would be primarily derived from Latin and Greek words, the Greek being filtered through the Latin. Roman engineering had the same effect on scientific terminology as a whole. Latin law principles have survived partly in a long list of Latin legal terms. Throughout European history, an education in the classics was considered crucial for those who wished to join literate circles. Instruction in Latin is an essential aspect. In today’s world, a large number of Latin students in the US learn from Wheelock’s Latin: The Classic Introductory Latin Course, Based on Ancient Authors. This book, first published in 1956, was written by Frederic M. Wheelock, who received a PhD from Harvard University. Wheelock’s Latin has become the standard text for many American introductory Latin courses. 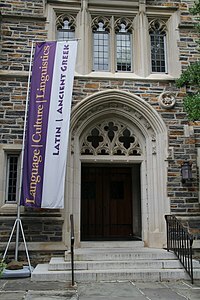 The Living Latin movement attempts to teach Latin in the same way that living languages are taught, as a means of both spoken and written communication. It is available at the Vatican and at some institutions in the US, such as the University of Kentucky and Iowa State University. The British Cambridge University Press is a major supplier of Latin textbooks for all levels, such as the Cambridge Latin Course series. It has also published a subseries of children’s texts in Latin by Bell & Forte, which recounts the adventures of a mouse called Minimus. In the United Kingdom, the Classical Association encourages the study of antiquity through various means, such as publications and grants. The University of Cambridge, the Open University, a number of prestigious independent schools, for example Eton, Harrow, Haberdashers’ Aske’s Boys’ School, Merchant Taylor’s School, Via Facilis and Rugby, a London-based charity, run Latin courses. In the United States and in Canada, the American Classical League supports every effort to further the study of classics. Its subsidiaries include the National Junior Classical League (with more than 50,000 members), which encourages high school students to pursue the study of Latin, and the National Senior Classical League, which encourages students to continue their study of the classics into college. The league also sponsors the National Latin Exam. Classicist Mary Beard wrote in The Times Literary Supplement in 2006 that the reason for learning Latin is because of what was written in it. Classical Latin distinguished between long and short vowels. Then, long vowels, except for ⟨I⟩, were frequently marked using the apex, which was sometimes similar to an acute accent ⟨Á É Ó V́ Ý⟩. Long /iː/ was written using a taller version of ⟨I⟩, called i longa “long I”: ⟨ꟾ⟩. In modern texts, long vowels are often indicated by a macron ⟨ā ē ī ō ū⟩, and short vowels are usually unmarked except when it is necessary to distinguish between words, when they are marked with a breve ⟨ă ĕ ĭ ŏ ŭ⟩. The sequences sometimes did not represent diphthongs. ⟨ae⟩ and ⟨oe⟩ also represented a sequence of two vowels in different syllables in aēnus [aˈeː.nʊs] “of bronze” and coēpit [kɔˈeː.pɪt] “began”, and ⟨au ui eu ei ou⟩ represented sequences of two vowels or of a vowel and one of the semivowels /j w/, in cavē [ˈka.weː] “beware!”, cuius [ˈkʊj.jʊs] “whose”, monuī [ˈmɔn.ʊ.iː] “I warned”, solvī [ˈsɔɫ.wiː] “I released”, dēlēvī [deːˈleː.wiː] “I destroyed”, eius [ˈɛj.jʊs] “his”, and novus [ˈnɔ.wʊs] “new”. Old Latin had more diphthongs, but most of them changed into long vowels in Classical Latin. The Old Latin diphthong ⟨ai⟩ and the sequence ⟨āī⟩ became Classical ⟨ae⟩. Old Latin ⟨oi⟩ and ⟨ou⟩ changed to Classical ⟨ū⟩, except in a few words whose ⟨oi⟩ became Classical ⟨oe⟩. These two developments sometimes occurred in different words from the same root: for instance, Classical poena “punishment” and pūnīre “to punish”. Early Old Latin ⟨ei⟩ usually changed to Classical ⟨ī⟩. Latin was written in the Latin alphabet, derived from the Old Italic script, which was in turn drawn from the Greek alphabet and ultimately the Phoenician alphabet. This alphabet has continued to be used over the centuries as the script for the Romance, Celtic, Germanic, Baltic, Finnic, and many Slavic languages (Polish, Slovak, Slovene, Croatian, Bosnian and Czech); and it has been adopted by many languages around the world, including Vietnamese, the Austronesian languages, many Turkic languages, and most languages in sub-Saharan Africa, the Americas, and Oceania, making it by far the world’s single most widely used writing system. The Roman cursive script is commonly found on the many wax tablets excavated at sites such as forts, an especially extensive set having been discovered at Vindolanda on Hadrian’s Wall in Britain. 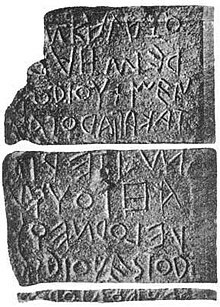 Most notable is the fact that while most of the Vindolanda tablets show spaces between words, spaces were avoided in monumental inscriptions from that era. Latin is a synthetic, fusional language in the terminology of linguistic typology. In more traditional terminology, it is an inflected language, but typologists are apt to say “inflecting”. Words include an objective semantic element and markers specifying the grammatical use of the word. The fusion of root meaning and markers produces very compact sentence elements: amō, “I love,” is produced from a semantic element, ama-, “love,” to which -ō, a first person singular marker, is suffixed. For example, amābit, “he (or she or it) will love”, is formed from the same stem, amā-, to which a future tense marker, -bi-, is suffixed, and a third person singular marker, -t, is suffixed. There is an inherent ambiguity: -t may denote more than one grammatical category: masculine, feminine, or neuter gender. A major task in understanding Latin phrases and clauses is to clarify such ambiguities by an analysis of context. All natural languages contain ambiguities of one sort or another. Genitive – used when the noun is the possessor of or connected with an object: “the horse of the man”, or “the man’s horse”; in both instances, the word man would be in the genitive case when it is translated into Latin. It also indicates the partitive, in which the material is quantified: “a group of people”; “a number of gifts”: people and gifts would be in the genitive case. Some nouns are genitive with special verbs and adjectives: The cup is full of wine. Poculum plēnum vīnī est. The master of the slave had beaten him. Dominus servī eum verberāverat. Vocative – used when the noun is used in a direct address. The vocative form of a noun is often the same as the nominative, with the exception of second-declension nouns ending in -us. The -us becomes an -e in the vocative singular. If it ends in -ius (such as fīlius), the ending is just -ī (filī), as distinct from the nominative plural (filiī) in the vocative singular: “Master!” shouted the slave. “Domine!” clāmāvit servus. Locative – used to indicate a location (corresponding to the English “in” or “at”). It is far less common than the other six cases of Latin nouns and usually applies to cities and small towns and islands along with a few common nouns, such as the word domus (house). In the singular of the first and second declensions, its form coincides with the genitive (Roma becomes Romae, “in Rome”). In the plural of all declensions and the singular of the other declensions, it coincides with the ablative (Athēnae becomes Athēnīs, “at Athens”). In the fourth-declension word domus, the locative form, domī (“at home”) differs from the standard form of all other cases. Latin lacks both definite and indefinite articles so puer currit can mean either “the boy is running” or “a boy is running”. There are two types of regular Latin adjectives: first- and second- declension and third-declension. They are so-called because their forms are similar or identical to first- and second-declension and third-declension nouns, respectively. Latin adjectives also have comparative (more –, -er) and superlative (most –, est) forms. There are also a number of Latin participles. Latin sometimes uses prepositions, depending on the type of prepositional phrase being used. Most prepositions are followed by a noun in either the accusative or ablative case: “apud puerum” (with the boy), with “puerum” being the accusative form of “puer”, boy, and “sine puero” (without the boy, “puero” being the ablative form of “puer”. A few adpositions, however, govern a noun in the genitive (such as “gratia” and “tenus”). A regular verb in Latin belongs to one of four main conjugations. A conjugation is “a class of verbs with similar inflected forms.” The conjugations are identified by the last letter of the verb’s present stem. The present stem can be found by omitting the –re (-rī in deponent verbs) ending from the present infinitive form. The infinitive of the first conjugation ends in -ā-re or -ā-ri (active and passive respectively): amāre, “to love,” hortārī, “to exhort”; of the second conjugation by -ē-re or -ē-rī: monēre, “to warn”, verērī, “to fear;” of the third conjugation by -ere, -ī: dūcere, “to lead,” ūtī, “to use”; of the fourth by -ī-re, -ī-rī: audīre, “to hear,” experīrī, “to attempt”. Irregular verbs may not follow the types or may be marked in a different way. The “endings” presented above are not the suffixed infinitive markers. The first letter in each case is the last of the stem so the conjugations are also called a-conjugation, e-conjugation and i-conjugation. The fused infinitive ending is –re or –rī. Third-conjugation stems end in a consonant: the consonant conjugation. Further, there is a subset of the third conjugation, the i-stems, which behave somewhat like the fourth conjugation, as they are both i-stems, one short and the other long. The stem categories descend from Indo-European and can therefore be compared to similar conjugations in other Indo-European languages. The fourth principal part is the supine form, or alternatively, the nominative singular of the perfect passive participle form of the verb. The fourth principal part can show one gender of the participle or all three genders (-us for masculine, –a for feminine and –um for neuter) in the nominative singular. The fourth principal part will be the future participle if the verb cannot be made passive. Most modern Latin dictionaries, if they show only one gender, tend to show the masculine; but many older dictionaries instead show the neuter, as it coincides with the supine. The fourth principal part is sometimes omitted for intransitive verbs, but strictly in Latin, they can be made passive if they are used impersonally, and the supine exists for such verbs. There are six “tenses” in the Latin language. These are divided into two tense systems: the present system, which is made up of the present, imperfect and future tenses, and the perfect system, which is made up of the perfect, pluperfect and future perfect tenses. Each tense has a set of endings corresponding to the person, number, and voice of the subject. Subject (nominative) pronouns are generally omitted for the first (I, we) and second (you) persons except for emphasis. As Latin is an Italic language, most of its vocabulary is likewise Italic, ultimately from the ancestral Proto-Indo-European language. 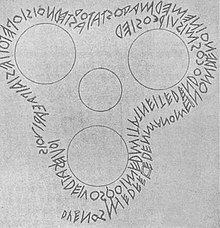 However, because of close cultural interaction, the Romans not only adapted the Etruscan alphabet to form the Latin alphabet but also borrowed some Etruscan words into their language, including persona “mask” and histrio “actor”. 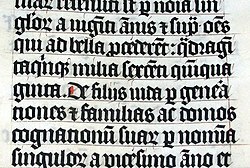 Latin also included vocabulary borrowed from Oscan, another Italic language. After the Fall of Tarentum (272 BC), the Romans began hellenizing, or adopting features of Greek culture, including the borrowing of Greek words, such as camera (vaulted roof), sumbolum (symbol), and balineum (bath). This hellenization led to the addition of “Y” and “Z” to the alphabet to represent Greek sounds. Subsequently the Romans transplanted Greek art, medicine, science and philosophy to Italy, paying almost any price to entice Greek skilled and educated persons to Rome and sending their youth to be educated in Greece. Thus, many Latin scientific and philosophical words were Greek loanwords or had their meanings expanded by association with Greek words, as ars (craft) and τέχνη (art). Because of the Roman Empire’s expansion and subsequent trade with outlying European tribes, the Romans borrowed some northern and central European words, such as beber (beaver), of Germanic origin, and bracae (breeches), of Celtic origin. The specific dialects of Latin across Latin-speaking regions of the former Roman Empire after its fall were influenced by languages specific to the regions. The dialects of Latin evolved into different Romance languages. Over the ages, Latin-speaking populations produced new adjectives, nouns, and verbs by affixing or compounding meaningful segments. For example, the compound adjective, omnipotens, “all-powerful,” was produced from the adjectives omnis, “all”, and potens, “powerful”, by dropping the final s of omnis and concatenating. Often, the concatenation changed the part of speech, and nouns were produced from verb segments or verbs from nouns and adjectives. ^ “Schools”. Britannica (1911 ed.). ^ Hammarström, Harald; Forkel, Robert; Haspelmath, Martin, eds. (2017). “Imperial Latin”. Glottolog 3.0. Jena, Germany: Max Planck Institute for the Science of Human History. ^ Hammarström, Harald; Forkel, Robert; Haspelmath, Martin, eds. (2017). “Latin”. Glottolog 3.0. Jena, Germany: Max Planck Institute for the Science of Human History. ^ Hu, Winnie (6 October 2008). “A Dead Language That’s Very Much Alive”. New York Times. ^ Eskenazi, Mike (2 December 2000). “The New case for Latin”. TIME. ^ Collier’s Encyclopedia: With Bibliography and Index. Collier. 1958-01-01. p. 412. 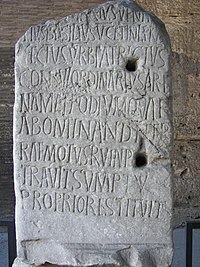 In Italy, all alphabets were originally written from right to left; the oldest Latin inscription, which appears on the lapis niger of the seventh century BC, is in bustrophedon, but all other early Latin inscriptions run from right to left. ^ “Incunabula Short Title Catalogue”. British Library. Retrieved 2 March 2011. ^ Moore, Malcolm (28 January 2007). “Pope’s Latinist pronounces death of a language”. The Daily Telegraph. Retrieved 16 September 2009. ^ “Liber Precum Publicarum, The Book of Common Prayer in Latin (1560). Society of Archbishop Justus, resources, Book of Common Prayer, Latin, 1560. Retrieved 22 May 2012”. Justus.anglican.org. Retrieved 9 August 2012. ^ “Society of Archbishop Justus, resources, Book of Common Prayer, Latin, 1979. Retrieved 22 May 2012”. Justus.anglican.org. Retrieved 9 August 2012. ^ “Latein: Nuntii Latini mensis lunii 2010: Lateinischer Monats rückblick” (in Latin). Radio Bremen. Archived from the original on 18 June 2010. Retrieved 16 July 2010. ^ Dymond, Jonny (24 October 2006). “Finland makes Latin the King”. BBC Online. Retrieved 29 January 2011. ^ “Nuntii Latini” (in Latin). YLE Radio 1. Retrieved 17 July 2010. ^ Loanwords in the World’s Languages: A Comparative Handbook (PDF). Walter de Gruyter. 2009. p. 370. ^ LaFleur, Richard A. (2011). “The Official Wheelock’s Latin Series Website”. The Official Wheelock’s Latin Series Website. ^ “University of Cambridge School Classics Project – Latin Course”. Cambridgescp.com. Retrieved 2014-04-23. ^ “Open University Undergraduate Course – Reading classical Latin”. .open.ac.uk. Retrieved 2014-04-23. ^ “The Latin Programme – Via Facilis”. Thelatinprogramme.co.uk. Retrieved 2014-04-23. ^ Beard, Mary (10 July 2006). “Does Latin “train the brain”?”. The Times Literary Supplement. Archived from the original on 14 January 2012. Retrieved 20 December 2011. No, you learn Latin because of what was written in it – and because of the sexual side of life direct access that Latin gives you to a literary tradition that lies at the very heart (not just at the root) of Western culture. ^ “Coins”. Croatian National Bank. 30 September 2016. Retrieved 15 November 2017. ^ “Conjugation”. Webster’s II new college dictionary. Boston: Houghton Mifflin. 1999. ^ a b Wheelock, Frederic M. (2011). Wheelock’s Latin (7th ed.). New York: CollinsReference. ^ Norberg, Dag; Johnson, Rand H, Translator (2004) . “Latin at the End of the Imperial Age”. Manuel pratique de latin médiéval. University of Michigan. Retrieved 20 May 2015. Vincent, N. (1990). “Latin”. In Harris, M.; Vincent, N. The Romance Languages. Oxford: Oxford University Press. ISBN 978-0-19-520829-0. “Latin Dictionary Headword Search”. Perseus Hopper. Tufts University. Searches Lewis & Short’s A Latin Dictionary and Lewis’s An Elementary Latin Dictionary. Online results. “Online Latin Dictionary with conjugator and declension tool”. Olivetti Media Communication. Search on line Latin-English and English-Latin dictionary with complete declension or conjugation. Online results. “Latin Word Study Tool”. Perseus Hopper. Tufts University. Identifies the grammatical functions of words entered. Online results. Aversa, Alan. “Latin Inflector”. University of Arizona. Identifies the grammatical functions of all the words in sentences entered, using Perseus. “Latin Verb Conjugator”. Verbix. Displays complete conjugations of verbs entered in first-person present singular form. “Online Latin Verb Conjugator”. Displays conjugation of verbs entered in their infinitive form. Whittaker, William. “Words”. Notre Dame Archives. Archived from the original on 18 June 2006. Identifies Latin words entered. Translates English words entered. “Alpheios”. Alpheios Project. Combines Whittakers Words, Lewis and Short, Bennett’s grammar and inflection tables in a browser addon. Dymock, John (1830). A new abridgment of Ainsworth’s Dictionary, English and Latin, for the use of Grammar Schools (4th ed.). Glasgow: Hutchison & Brookman. “Classical Language Toolkit” (CLTK). A Natural Language Processing toolkit for Python offering a variety of functionality for Latin and other classical languages. der Millner, Evan (2007). “Latinum”. Latin Latin Course on YouTube and audiobooks. Molendinarius. Retrieved 2 February 2012. Byrne, Carol (1999). “Simplicissimus” (PDF). The Latin Mass Society of England and Wales. Retrieved 20 April 2011. (a course in ecclesiastical Latin). Harsch, Ulrich (1996–2010). “Ludus Latinus Cursus linguae latinae”. Bibliotheca Augustiana (in Latin). Augsburg: University of Applied Sciences. Retrieved 24 June 2010. Griffin, Robin (1992). A student’s Latin Grammar (3rd ed.). University of Cambridge. ISBN 978-0-521-38587-9. Lehmann, Winifred P.; Slocum, Jonathan (2008). “Latin Online, Series Introduction”. The University of Texas at Austin. Retrieved 16 September 2009. Cui, Ray (2005). “Phonetica Latinae-How to pronounce Latin”. Ray Cui. Retrieved 25 June 2010.